These Double Chocolate Waffles are loaded with chocolate SunCups and topped with raspberries for the ultimate special occasion breakfast treat that’s out of this world! Do you know what today is? It’s waffle day, my friends. And not just any waffles. My very favorite, kid-approved, much beloved homemade Double Chocolate Waffles, completely from scratch! 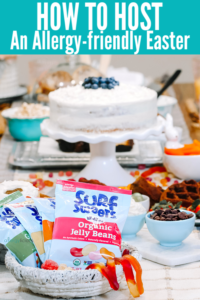 One of the reasons why I love this recipe is that it’s like dessert for breakfast! I wanted to do a special, indulgent breakfast and since I have a bit of a sweet tooth, I decided to play off of my Chocolate Chip Brownie Waffle from a few years ago. 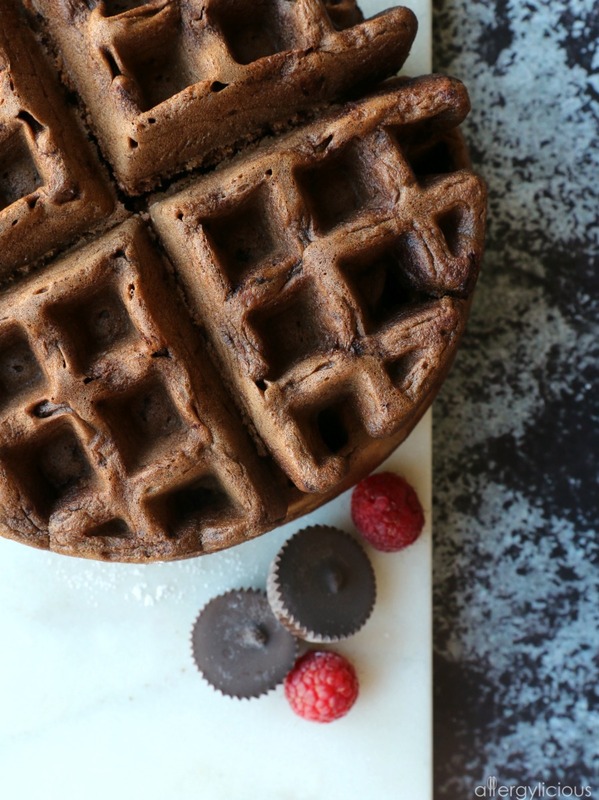 With a few little tweaks, this Double Chocolate Waffle is just as decadent, but extra light and fluffy, thanks to my new Belgian Waffle maker. They are also vegan, which makes me extra happy! Who are we kidding….chocolate makes me happy! Now, I’ll be the first to say that this isn’t exactly a breakfast recipe that you should be eating on a regular basis. But special occasions call for special breakfasts, wouldn’t you agree? Like celebrating a birthday or when your kiddo gets straight A’s on their report card. Just make sure to eat some healthier foods during the week so you can splurge and indulge on those things that make you happy….like Double Chocolate Waffles. Our waffles use Bob’s 1-to-1 Gluten-free Baking Flour which is always in my pantry. Since I don’t claim to be a GF Genius, this flour blend makes it easy to transform a traditional recipe into gluten-free goodness. The chocolate comes from raw cacao powder, a superfood that I love using instead of regular cocoa. Not that it makes this waffle healthy, but this alternative does make it richer in antioxidants, iron, magnesium & fiber. I’ll take that anyday….with an extra sprinkling of confectioners sugar, of course! And don’t forget about the dairy-free Greek yogurt. Its acidic nature helps make the chocolate waffles extra fluffy and light, while adding a delicately tangy flavor. Plus the acidity reacts with the baking soda which helps with leavening (important since we don’t use eggs). Two dairy-free yogurts to consider are Good Karma (which uses flax) and Daiya Foods (coconut milk based alternative), both yield similar results, but choose according to your allergens. Our extra chocolate-y bonus comes from the add-in of chopped Sun Cups Minis from Free2B Foods. 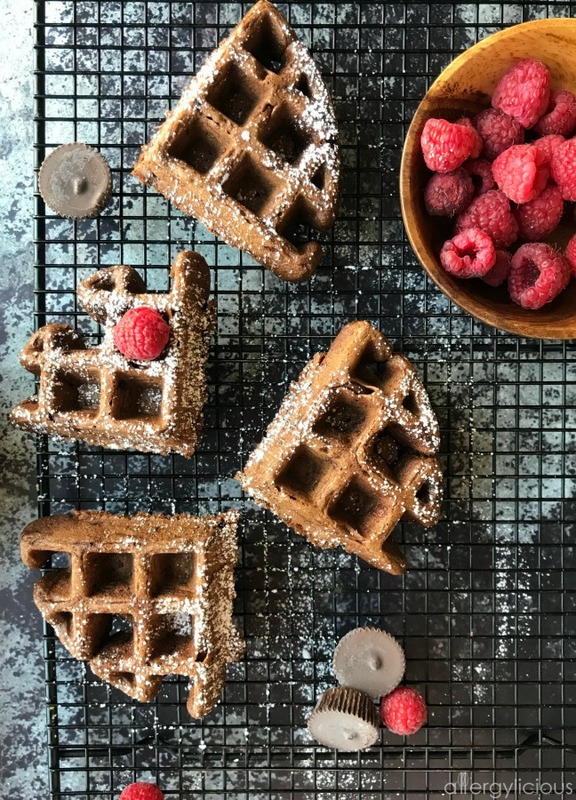 This light and creamy, dairy-free, chocolate treat filled with sunflower seed butter is Top 12 Allergen Free, vegan and makes these waffles over the top tasty! But let’s be honest, they may never make it into the waffles if you start snacking on them beforehand. I highly suggest you get an extra bag and hide them in a safe place for recipes such as this! 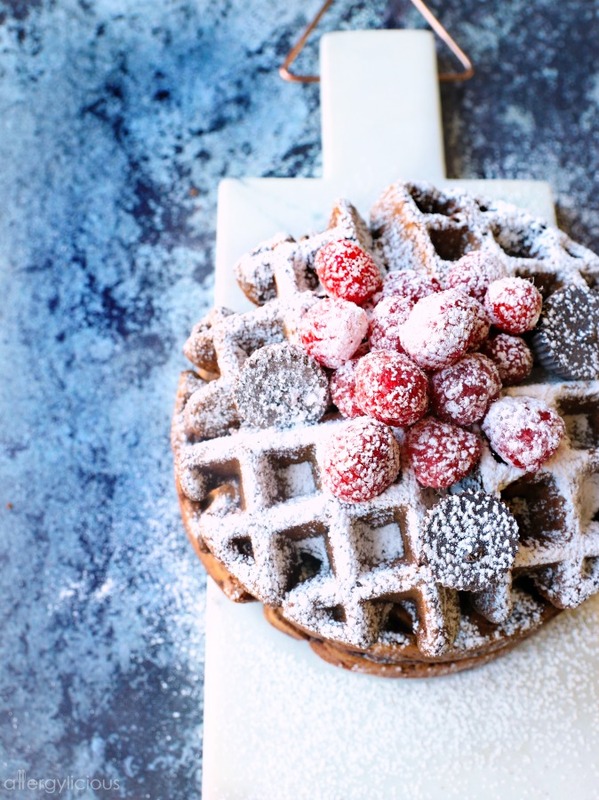 Then top these Double Chocolate Waffles with fresh raspberries and a sprinkling of powdered sugar. Unless you’re my son Xander, then just dump the sugar on top! The waffles will be remarkably delicious either way. Enjoy! How do you top off your waffles? These Double Chocolate Waffles are not only easy to make, but also rich in chocolate-y goodness. 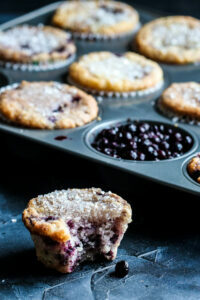 All you need are a few allergy-friendly ingredients and they turn out light, fluffy & scrumptious! Truly one of our favorite waffle recipes! In a large bowl, soft together all the dry ingredients, then create a well in the center. In a medium bowl, whisk together all the wet ingredients. Pour into the center of dry ingredients then mix together. Add in chopped chocolate SunCups then finish mixing completely. Add proper amount of batter to waffle iron per waffle iron’s directions. For our Belgian Waffles, we used 1/2 cup batter. Cook until “ready” light turns on or steam stops coming out of the iron. Top with dairy-free butter, fresh raspberries and cocowhip for an extra splurge. How perfect is this for Valentine’s day! I need to break out my waffle iron, it certainly does not get the love it deserves. These would be perfect for Valentine’s Day! I love how these are light and fluffy! 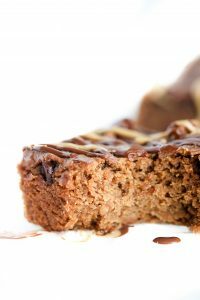 Chocolate is one of my favorite flavors, and it’s always great when I can incorporate it into a breakfast treat. Your photos are absolutely stunning as well. How can you not be happy starting your day with chocolate?! These look terrific! Thanks Kelly! Chocolate can make the day a little brighter. These look so good!! I have everything to make them so I’ll have to see if we can fit them in Saturday morning! My family wouldn’t turn down waffles, especially chocolate ones! Chocolate is difficult to turn down in our house as well. Hope you were able to indulge a little this weekend. Gosh these waffles look amazing! I haven’t made waffles in ages and must make this next! 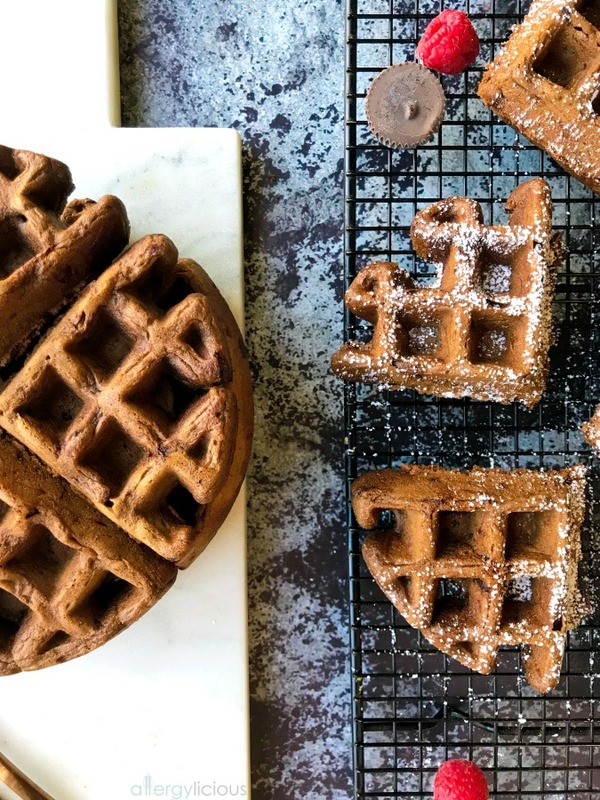 These will be perfect to get you back into waffle-making. It does bring on the smiles. You have inspired me to make waffles! These look so good. I think I might sneak them into my kid’s lunches for a special treat! I always make an extra batch, just for school lunches! A well made waffle is a thing of beauty. You have really outdone yourself with these waffles! Thanks K.C.! I love a pretty waffle too. I want to turn these into a dessert….with salted caramel sauce and whipped cream! 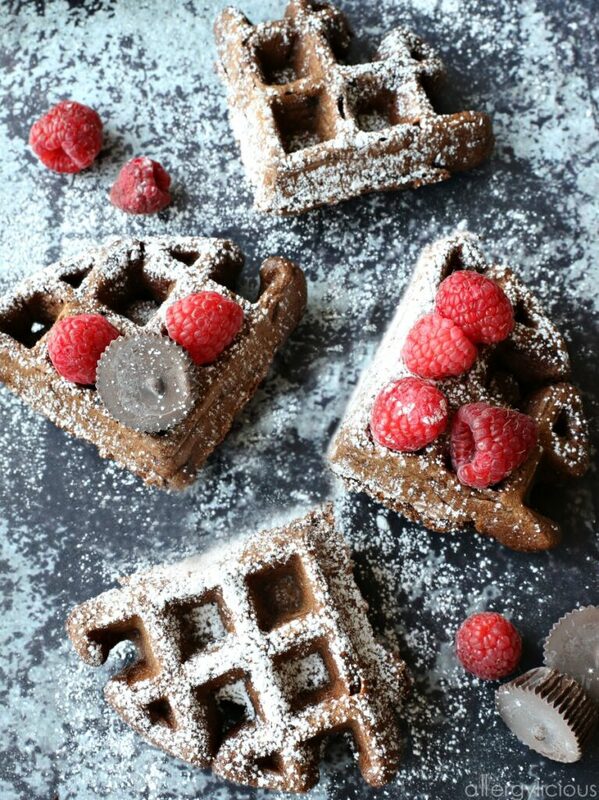 This recipe is seriously my two favorite things- Chocolate and Waffles! I might end up making these every Saturday! It may just become your most favorite day of the week. I think I’d be tempted to go all chocolate syrup on these for triple chocolate 🙂 They look beautiful Nicole! This is by far my favorite waffle recipe that is gf and allergy-sensitive. I only had 1/6 cup of oil this time so I replaced the rest of the oil with mashed banana and it was even better!!! Will try your other recipes. Thanks a ton! Skyla I love how you adapted it! I actually had that happen in my last batch and subbed with some applesauce and it worked like a charm as well!